According to my credit card statements, I spend a lot of money. At any one time, the sum of my credit card balances tends to hover anywhere from $5,000 to $10,000 yet I only spend about $1,000-$2,000 a month. The reason why my balances are so high is because I do what’s known as manufactured spending. As you might have guessed, manufactured spending is just what it sounds like: it’s spending that you manufacture on a credit card. Ok let’s not sugar coat it, it’s basically a legal way to launder money(but a lot of people like to pretend they’re not doing something unethical). I’ll admit that manufactured spending is slightly unethical but when a credit card company is on the losing end of a deal you might as well call me Robin Hood. Now that that’s out of the way, the reason why you might want to MS is so that you can meet the terms of credit card sign-up bonuses. Most higher end credit cards will ask you to spend a few thousand dollars in 3 months in order to get 50,000 or 40,000 points. Generally, the higher the sign-up bonus, the more you have to spend though. I’m currently in the midst of trying to meet my largest single spend requirement ever: $10,000 in 3 months for the Citi Executive AA card. $10,000 in 3 months might seem like a lot but that’s where manufactured spending comes in. Vanilla Reloads are like a prepaid debit card that can be added to accounts with various payment services. I use Vanilla Reloads to load my Bluebird credit card from Amex and then pay my rent, mortgage, or even write someone a check. Bluebird is a pretty cool service but you need both Bluebird and Vanilla reloads in order to MS.
You can buy Vanilla Reloads at grocery stores, drug stores and gas stations but a lot of stores are starting to crack down on paying for Vanilla Reloads with a credit card. The Vanilla Reloads cost $3.95 and you can load up to $500 per card. So you’re basically paying a fee of .8% for Vanilla Reloads but you’re getting back at least 1% back by paying with a credit card. Where Can You Find Vanilla Reloads? I actually tried buying a Vanilla Reload for the first time the other day and it was a success! I went to the CVS in Seal Beach and bought a Powerade and two vanilla reload cards for $500 each. The cashier was pretty nice about it, she took down some info from my ID, rang me up and I was on my way. Apparently, if you buy more than $500 in Vanilla Reloads the CVS cashier is forced to type in some information from your driver’s license. But I don’t really see this as a big deal since you’re not doing anything wrong(not yet at least!) by buying these cards. CVS even recently raised their Vanilla Reload limit to $5,000 per day. A lot of people have reported having some trouble finding stores willing to accept credit card payment for Vanilla Reloads but in my case it was pretty easy. I’d suggest keeping an eye out for them on your next trip to the grocery store and try to buy one along with your normal groceries and see what happens. What do you do with a Vanilla Reload? 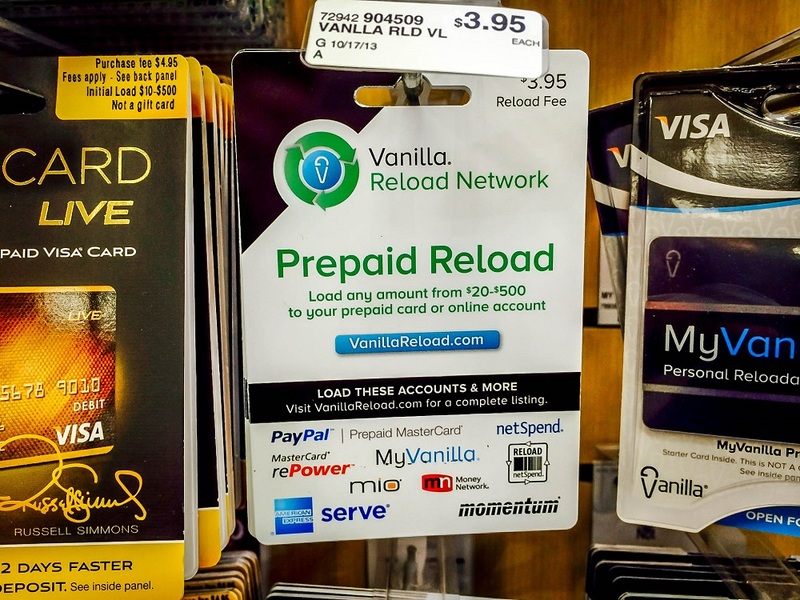 The cool thing about the Vanilla Reloads is that as soon as you buy them you can go to www.vanillareload.com and load them onto your Bluebird card instantly. All you need is the 10 digit PIN found on the back of your Vanilla Reload and the 15 digit account number on the front of your Bluebird card. I had both my cards loaded up in about 30 seconds and I wrote a check to my fiancee for $1,000. Bluebird is a free payment service from American Express but pretty much the only reason I use it is for manufactured spending. You can use Bluebird to write checks to your landlord, pay your mortgage, or even pay your credit card bill(yes the same credit card bill that you bought the Vanilla Reloads with). I try to stay under the radar and mix up my Bluebird spending but they don’t seem to be too strict. So there you have it, what do you think about manufactured spending with Vanilla Reloads? After Amazon Payments, Vanilla Reloads are probably the second easiest way of MS’ing. The only trouble you’ll have is finding a merchant willing to accept credit card payment for Vanilla Reloads. I’m also on the Vanilla Reload train. Currently, I’m sitting at $8,200 of manufactured spending on the same American Airline 100K bonus MasterCard…I’ve had the card for 7 days! As for loading the Vanilla Reload cards with credit cards, it seems those days are numbered. I tried to buy one yesterday in Lake City, Florida and got no love. The same thing happened in Nashville, Georgia. However, a few days earlier I was able to buy one in Tifton, Georgia with plastic. Going forward I think I’ll try an Account Now Visa card; they can be loaded a number of ways. Amazon Payments, PayPal are some other useful ways to manufacture spending. Good luck “blowing” all that money on credit cards. Now we just have to buy Visa Vanilla gift cards and cash them out for money orders. We can also load them onto our Bluebird accounts at a Walmart Money Center. It’s more of a hassle but worth it IMO. Yea I tried one in California yesterday and the cashier and manager both weren’t aware of the policy and let me pay with a card but it was already hard coded into the system to deny cards for VR purchases. I saw some other people in CA were still having luck yesterday but I suspect by Monday it will all be over. Already dead on East Coast. I had a little AOR planned for today and was going to apply for a second AA Exec card, Barclay Arrival and Chase Ink Bold but that would be 18k total spending in 3 months. Don’t think I can MS that without VR’s 🙁 But if I get denied for Arrival and/or Bold then I’ll go for a second Exec card. Did you know they are churnable? I had heard about this on another blog earlier this week and thought it was such a great idea (being able to pay your mortgage with a card and reap the rewards? Awesome! ), so it’s too bad that they removed the option to pay with a credit card. I can’t imagine that there is any purpose of buying Vanilla Reloads except for these hacks, but I guess they must have one, because otherwise they wouldn’t have removed the credit card option. Hopefully another company catches on and starts providing something similar. Yea I’m sure there are people out there buying them for legitimate reasons but they definitely got shut down because of the more illegitimate people like me. I seen this Vanilla reload on IG & I’m wondering if it’s a legit way to make money? Not really. People use it to hit spend requirements for credit cards and get bonuses/miles/points that way.